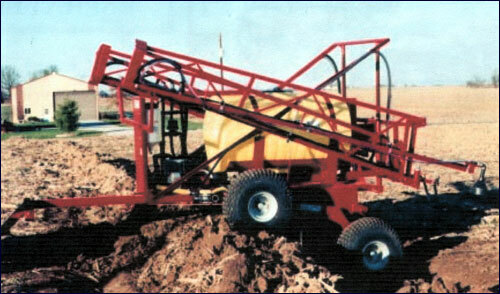 The Levee Leaper has an adjustable stop to prevent the leading wheels from hitting the furrow wall. LL axle design prevents dragging. 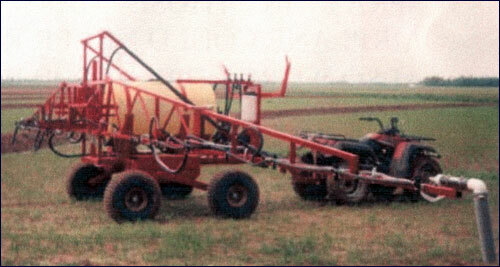 Pulling vehicle is up and over and out of the furrows before it begins to pull the sprayer over the levee. - Also works great for row crops, burndown, etc. BEAN BLASTER, TWIN JET TIPS, SPRAYS TWO FLAT FAN PATTERNS, ONE 30 DEGREES FORWARD, ONE 30 DEGREES BACKWARDS FOR DOUBLE COVERAGE 110 DEGREE ANGLE TIP FOR 100% OVERLAP RESULTS IN FOUR ANGLES OF ATTACK ON 30" CENTERS, "TAKES ADVANTAGE OF THE CHISEL EFFECT". UNBELIEVABLE COVERAGE MAKES THE BEAN BLASTER EXCELLENT FOR ALL POST PRODUCTS AND BURNDOWN WORK. ALL STAINLESS TIPS.